The following morning a friend of Steve, PC496’A’ Ron Pope, was on duty at the Arch manning the switchboard. He took the call from Steve’s fiancée inquiring why he hadn’t been to see her. 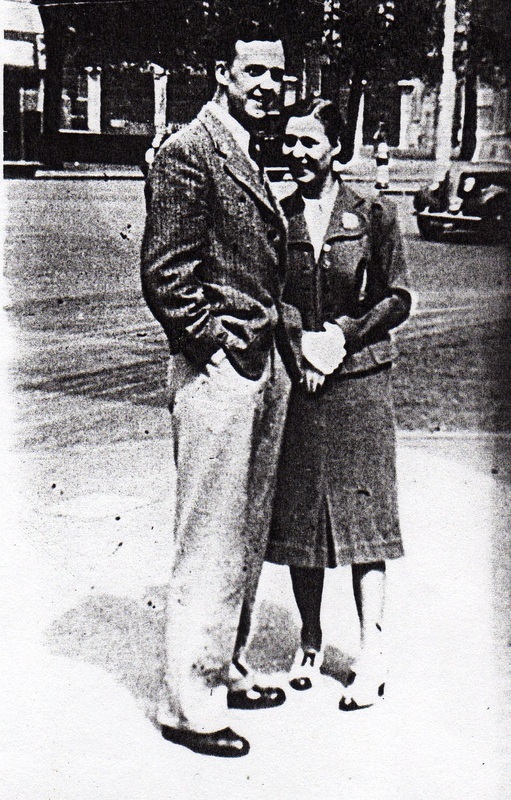 The job of collecting Steve's parents from their home was given to his old friend Jimmy Whyte. He escorted them to Pimlico Hall, a temporary morgue. Whilst he was there a porter pulled him to one side and showed him a severed arm from a victim of the Cafe de Paris bombing. The hand was still grasping a half crown. A few days later the sad task of having to pack Steve’s personal effects and send them off to his parents in Dagenham fell to the Arch Sergeant, PS13’A’ Johnny Bull. 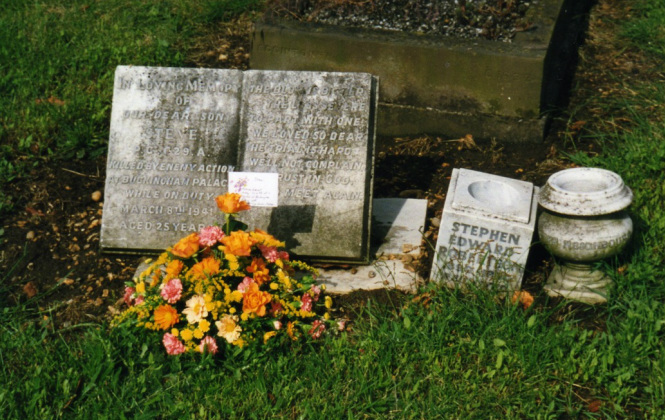 Steve's graveside, 10th June 1998 with flowers from the Royalty Protection Social & Athlectic Club. 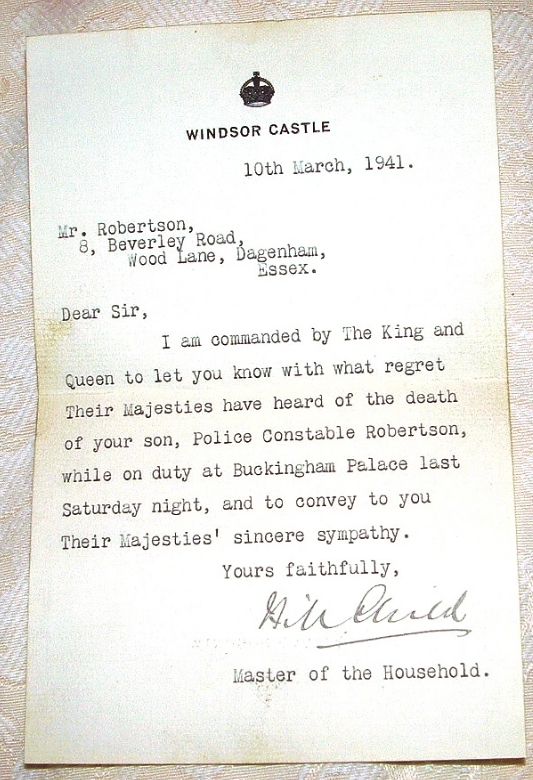 The letter of condolence from the Royal Household. 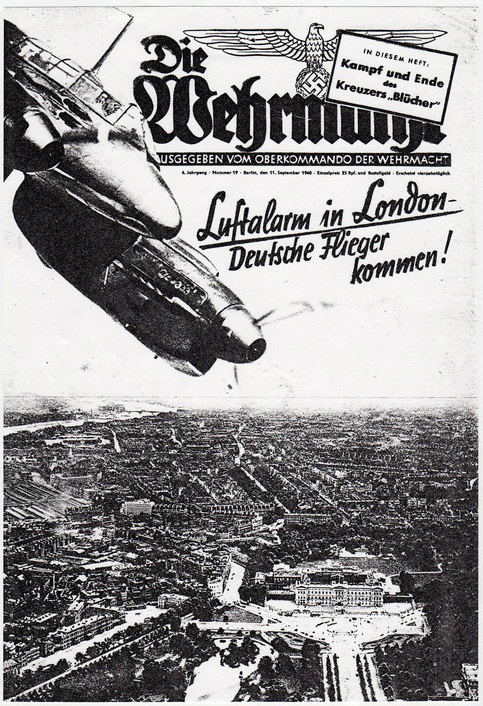 The ‘Blitz’ stopped two months after Steve's death. The Palace suffered one more attack on the 20th July 1944, when the garden wall near Hyde Park Gate was hit by a V rocket, the King went to inspect the damage but due to press censorship it was merely reported as ‘King visited V bomb damage in South of England.’ It was this damage that became the down fall of PC Phil Eagles in more than one way. Having been retired the year before, when his knee was badly hurt in a bombing at his home address, he manage to rejoin being posted to the Palace. Acting on information that boys had climbed the temporary hoarding at the damaged wall he gave chase over the rubble. He fell onto his bad knee which resulted in being retired for the second time. 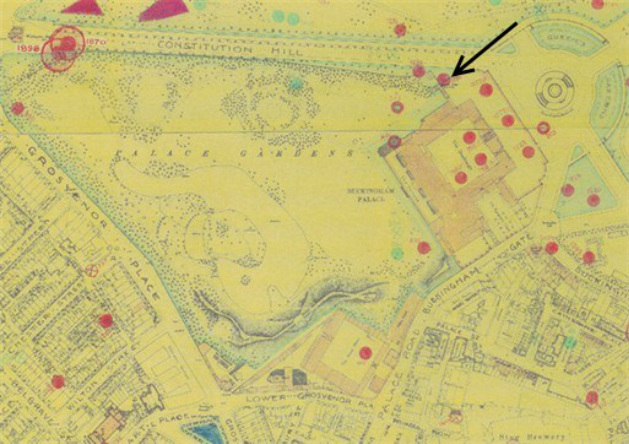 Locations of bombs dropped on or around Buckingham Palace, the Garden Gate bomb is arrowed. One of the bombs that hit the forecourt the same day Robertson was killed had a lasting effect on PC ‘Buster’ Tuffnel. He had taken cover next to where the bomb landed. I have been told that Buster was never the same again, contracting Multiple Sclerosis shortly after and having to remain at Wellington Arch on light duties, until he was retired. Fate may have had a hand in the events, but PC Sims, who had missed the fateful shift, was accepted for the RAF. Based in North Africa as a Sergeant Bomber, his plane went missing and all were presumed dead on 24th October 1943. An extract from a letter from Doug Lightwood, Sept. 4th 1993. The Hitler Youth dagger that was given to Steve Robertson during his visits to Germany. By the end of the war 31 regulars had lost their lives in the Navy, 77 were killed serving in the Army. The largest number to be killed was 383 serving with the RAF; this brings the total number of Metropolitan police officers killed during World War Two to 699. No record of those auxiliary officers who left the Force and were later killed in the Armed Forces was kept. When the War ended only 19,000 officers were left in the Force a further 2,700 left by the end of 1945.